We recommend it as a daily dietary supplement to anyone wishing to lose weight. 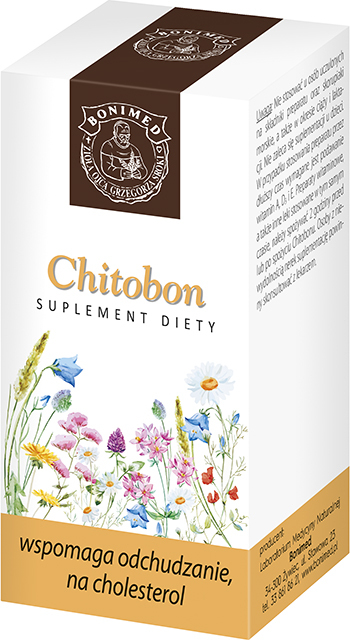 Because it contains chromium, Chitobon helps maintain the right level of sugar in blood serum. Because of the chitosan contents, the product reduces fat absorption in the gastrointestinal tract, which contributes to maintaining normal levels of cholesterol in blood serum. Ingredients: Chitosan (obtained from crustaceans), gelatin, anti-caking agent (magnesium stearate, silicon dioxide), yeast enriched with chromium. Recommended daily intake of the product (9 capsules) contains: Chitosan (obtained from crustaceans) 4.5 g, chromium 90 mcg*. Recommended intake: Take 3 capsules 2–3 times per day 20 minutes before a meal, take with 1 glass of water. Dietary supplements should not be treated as a substitute (replacement) of a varied diet. Do not exceed recommended daily intake during the day. Contraindications: Don’t use it if you are allergic to the product ingredients and marine crustaceans. If you are pregnant or breastfeeding, don’t use it. Taking the product by children is not recommended. Warning: If you take the product for a longer time, you should also take vitamins A, D3, and E. Vitamins and other remedies used at the same time should be taken 2 hours before or after taking Chitobon. If you have kidney failure, talk to your doctor before taking the product.